"I intend to win the next election and lead this country," declares opposition leader. At the end of a tense week between the coalition and the opposition, the head of the opposition, MK Yitzchak Herzog (Labor), said on Saturday night that he has no intention of joining Prime Minister Binyamin Netanyahu’s coalition. Speaking to Channel 10 News, Herzog launched a scathing attack on Finance Minister Yair Lapid (Yesh Atid) and accused of him being a failure. “One year since the election and not one achievement,” he charged. "In terms of housing, in terms of the cost of living and the erosion of the middle class, Lapid does not have one achievement. He failed in all these things and is trying to hide it by putting on an artificial celebration like the one he tried to produce this week," stated Herzog, referring to the Knesset’s passing of three controversial laws, one of which was the new draft law that was pushed by Lapid. In a recent interview with Arutz Sheva, Herzog voiced some criticism over the government's efforts to draft hareidi men into the IDF. Despite supporting the enlistment of hareidim into the army, Herzog lamented what he saw as an overly combative approach by elements within the government, possibly a reference to the Yesh Atid party, which he said had in fact led to a "futile result". "I am very sad... very sorry for the fact that communities clash with communities in the Land of Israel, because that should not be the case," he said. "There should be further dialogue and further talks between the parties, and not one shoving the other and making a [political] point." The opposition announced early last week that it would boycott debates on the three controversial laws. In addition to the draft law, the laws in question also included the Governance Bill, which significantly raises the voting threshold, risking several small parties’ ability to enter Knesset; and the National Referendum bill, which would require the government to hold a national referendum before conceding Israeli territory to a foreign entity. The boycott was in opposition to how coalition MKs were called on to pledge they would vote for the laws, and for the limited timeframe of debates. Despite the opposition’s boycotts, the coalition held the votes on the laws and all three passed. 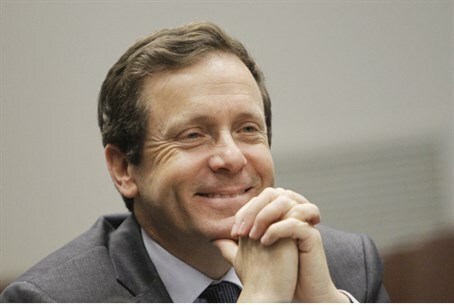 During Saturday’s interview, Herzog said that he is an alternative to Netanyahu, adding that he has no doubt that he can head the next coalition. "I'm going to win the next election and form the next government. Why not say it? I intend to lead the country," he explained. Herzog also clarified that he has no intention of entering the Netanyahu government. "I said all along that if Netanyahu makes a brave diplomatic move we will back him from the outside. I met three times in the last three months with U.S. Secretary of State John Kerry and I told him that we would go with Netanyahu if brings an agreement," he said. In the midst of the row between coalition and opposition, Herzog received backing this week from Shas, whose chairman Aryeh Deri lavished praise on Herzog and declared his support for the opposition leader for Prime Minister. "I was asked if Herzog is an appropriate candidate for Prime Minister - and the answer is yes," Deri stated, eliciting applause from a convention of opposition members who held their own meeting as the coalition debated the Governance Bill.